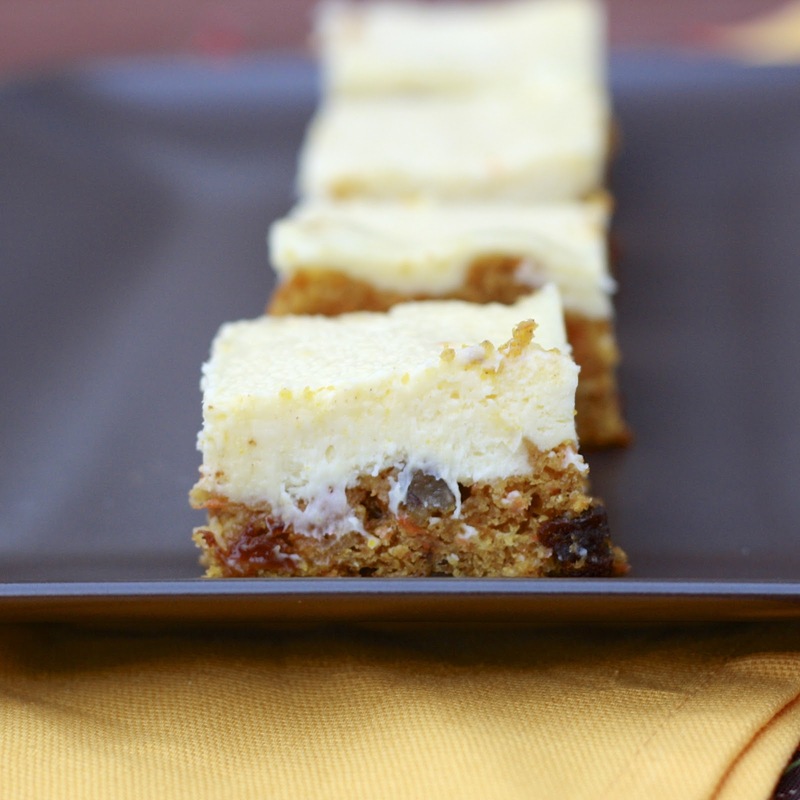 Carrot cake cheesecake bars are the cousins of carrot cake. 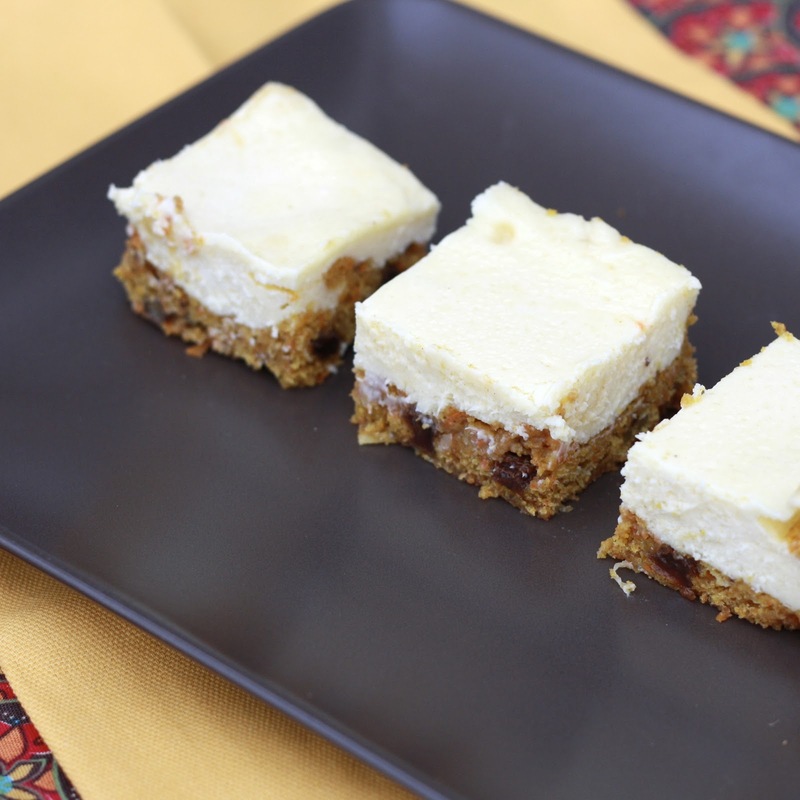 They have all the same elements of carrot cake but require significantly less time and energy to make. No multiple pans or uneven cake layers! The ratio is about 1:1 when it comes to the carrot cake and cheesecake portions. I included raisins, nuts, and coconut in the cake layer, but purists could just as easily eliminate them. I made these for my brother-in-law Nate’s birthday last month, knowing that carrot cake is on his supposedly short list of approved desserts (becoming part of our family has seemed to expand his sweet tooth! Mission accomplished!). He gave them two thumbs up (literally--it's the boy's trademark) and I now have a solution next time we're craving carrot cake but not the time involved! 1. Preheat oven to 350F. Line a 9 x 13 inch pan with foil and spray with cooking spray. Beat all crust ingredients in a large bowl with an electric mixer until a thick dough forms. Press dough into the prepared pan, spreading in an even layer. Set aside while you prepare the filling. 2. In the bowl of an electric mixer, beat the cream cheese on medium until fluffy. Beat in sweetened condensed milk, scraping down the sides of the bowl, until the mixture is smooth. Add the sour cream, salt, vanilla, and eggs, mixing until combined. 3. Pour cheesecake mixture over the cake, spreading evenly. Bake for 20-25 minutes, or until just set (center should slightly jiggle). 4. Allow pan to cool completely on a wire rack. Cover and refrigerate until bars are set, 2-3 hours, or overnight. Cut into bars and serve chilled.